We've been to the pool more so far this summer than we have in summers past. Both kids just completed swim lessons at a local university and we've had a few pool playdates with friends who are either members of a pool or who have a pool. Yay for water fun in this crazy hot weather we've had lately! To get both kids (and myself) ready for a day of pool fun, it takes a big ol' bag of supplies. Here's what I've been using this summer. The bag: my trusty Lands End Natural Canvas Tote (medium) and it's only $20 right now! I also use this for some car trips. I still have to carry some a towel or some floats in my arms (or make the kids do it), but I don't want to have a tote that is way to big to handle/store. The brush: My little lady has long, wavy/curly hair. I braid it for the pool but it's still an ordeal to get it combed after rinsing. I read about this Wet Brush in two magazines recently and got on Amazon and ordered it right away. AMAZING! No more crying after pool/bath because I'm pulling her hair out trying to get it combed. And I had to get purple, her new favorite color. The towels: We use normally just use their Disney towels that the kids received as gifts a few years ago, personalized with their names. The sunscreen: We had previously used whatever I could find on sale, since we use so much. But this year, when we first applied sunscreen for a long day outside, both kids broke out in a rash all over their bodies. The same sunscreen we had used last summer without issue. So we switched to Babyganics Mineral-Based Baby Sunscreen and they haven't had any issues yet. The goggles: Because what kid likes to swim without goggles? We had some cheap Speed goggles (as shown above) that we got in a two pack at Costco last summer, but both kids wanted swim masks that covered their noses as well. So I found these at Target this week and they love them. The fit is great and they are easy to adjust. 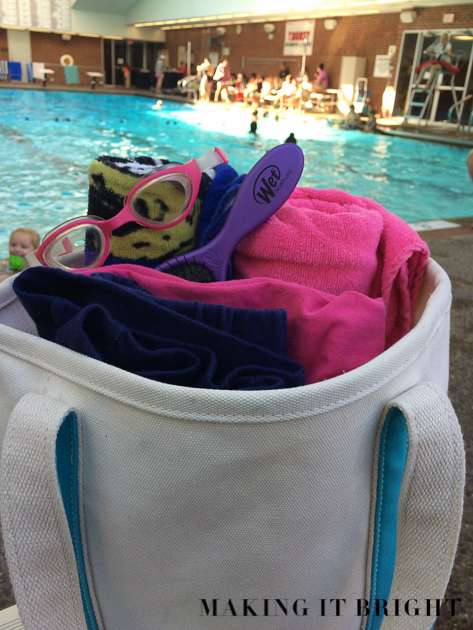 There are a few other things I always pack in our swim bag. I always pack a big water bottle full of ice water, a pack of gum (for me), and their Puddle Jumpers even though I'm trying to get my little lady confident enough to swim without hers. How do you enjoy pool time with the kids?